Royal Opera Chorus, Orchestra of the Royal Opera House / Antonio Pappano. Royal Opera House, London, England. Sunday, March 25th, 2018. 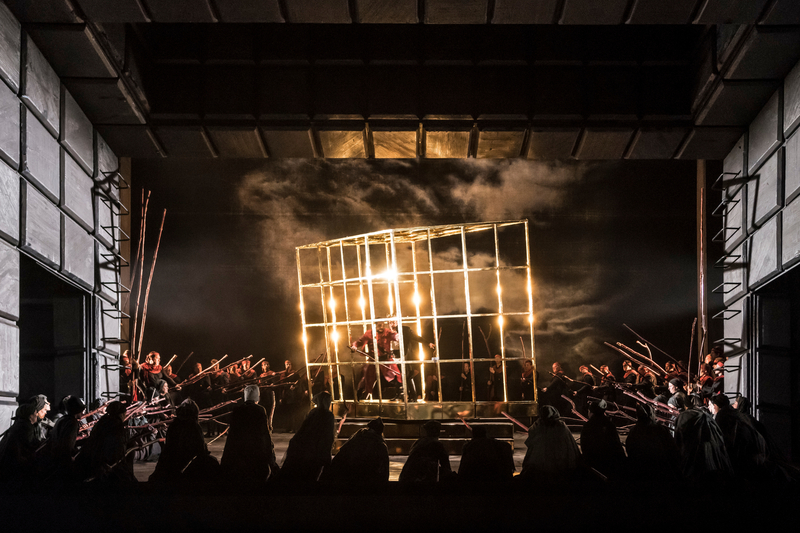 This afternoon’s performance of Macbeth came just after the Royal Opera House announced its 2018 – 19 season. That new season points to a certain conservatism in terms of repertoire and stage directors, with the works featured almost exclusively dating from the span of 130 years. In a way, today’s Macbeth is a precursor of things to come. Phyllida Lloyd’s staging, here revived by Daniel Dooner, is a fluent piece of work. As a production for an international cast to jump into, it does the job. It doesn’t ask much of its principals, rather they are simply left at the front of the stage to deliver. Likewise, the chorus is frequently parked with arms outstretched to the heavens. 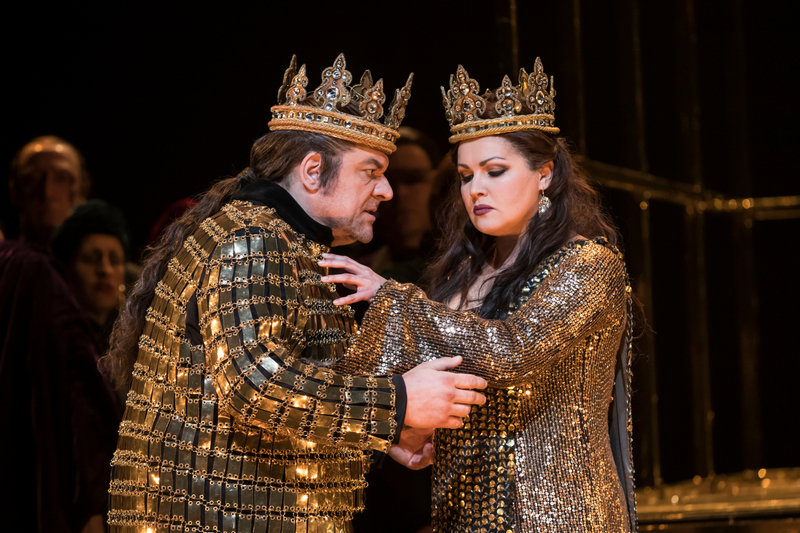 At the same time, Lloyd offers a fair bit of visual interest with some blingy outfits for Macbeth and his Lady in the banquet scene, as well as some golden horses as Macbeth hallucinates about his future. Otherwise, the witches are costumed in that international code for evil – black and red – and the remainder of the cast seems to be exclusively dressed in black. Indeed, the staging as a whole is rather dark. Interestingly, Lloyd places a faucet with running water on the right of the stage, reflecting the Lady’s need to constantly wash her hands. Another interesting insight is the presence of children in the Act 3 ballet, as if to remind the Macbeths of their childlessness. Yet, in both cases, these ideas feel added on as an afterthought, although in of themselves, they could have made an interesting starting point for a staging. There is a slight hint of the brutality that exists in the society in which the Macbeths operate, with bodies of the murdered strung up for all to see. Above all, what Lloyd gives us is a clear narrative based in the plot, with the chorus and actors well drilled to guide the action. Ultimately, this could be precisely what the Royal Opera’s conservative audience wants. It doesn’t especially offer any new insights, nor does it provoke discussion; rather, it offers easy Sunday afternoon viewing. 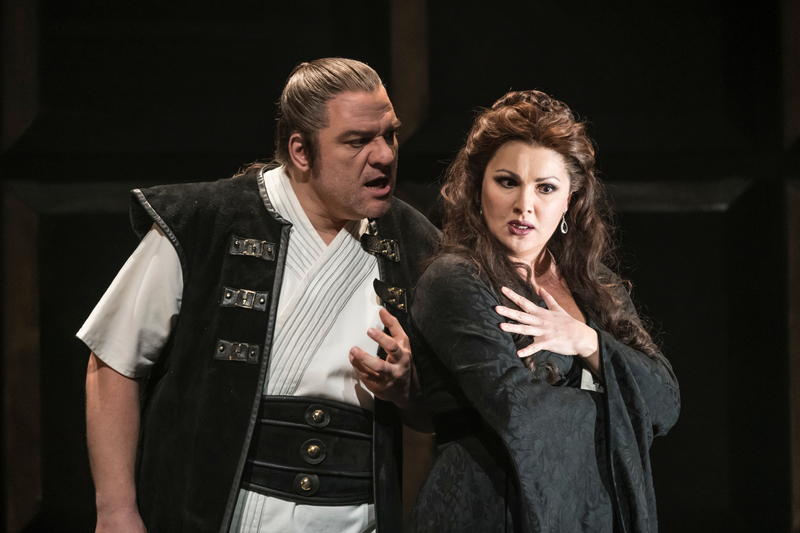 Anna Netrebko was certainly an exciting Lady. Exciting in the way that she rode the ensembles, but exciting also as one never knew if the voice would actually get to where it was aiming for. Her opening scena set out her stall – a voice made overly dark, registers not ideally integrated, and the initial high C an honourable near miss. Her coloratura was frequently sketchy, although in the banquet scene she made a respectable attempt at a trill. Her ‘luce langue’ was choppily phrased and the sleepwalking scene sung out constantly at forte or above. She made the D-flat at the end, just, but that again was sung out at forte instead of floated on the breath. While I admired her game stage presence and the way her fruity tone has filled out, I longed for something technically more reliable in the role. Clearly, her many admirers were full of admiration as the ‘brava’s rung out after each number. Željko Lučić’s Macbeth sang his closing aria with feeling, the lines long with dynamics to shade the tone. There were quite a few aspirates entering the sound so the legato at times felt lumpy. The tone itself lacks colour and loses the core at the top, lacking that iron-clad strength it really needs. His singing also felt quite generalized – everything he sang sounded identical, there was little sense of the ambition behind the character nor of the remorse and regret that he felt at the end. Yusif Eyvazov sang an impassioned ‘paterna mano’. He has an interesting fast vibrato and the sound also tightened up at the top. The most satisfying principal was Ildebrando D’Arcangelo’s Banco who sang his aria with warm, inky tone and an admirable legato. There was a dignity there that was fully as one with his character. Notable contributions also from the warm-voiced Doctor of Simon Shibambu and Francesca Chiejina’s ruby-toned Dama. The Royal Opera Chorus once again consolidated the excellent improvements they have made under their new director, William Spaulding. The blend much improved, especially in the ladies, and there’s a discipline to the sound now that was previously lacking with a unanimity to final consonants much tighter than before. The orchestra played respectably for Antonio Pappano. His conducting, as so often feels the case, seemed to focus on the sentences rather than the paragraphs. I missed a sense of an overall line running through scenes although he did bring out some of the sepulchral beauty of the score in places. String attack was flaccid and tempi for the most part felt too slow. The audience clearly appreciated today’s performance, greeting the cast, orchestra and conductor with a warm ovation. The staging was certainly fluent and had a clarity of storytelling that was admirable, but despite the intermittent gore, I never really felt that I got a sense of who the characters were and what their motivation was. The stage was dominated by Netrebko’s Lady who was certainly exciting but who also had several vocal rough edges. The remainder of the cast was efficient but not especially memorable. It did the job, perhaps, but could have been so much more. If you value the writing on this site, you can help expand its coverage by joining the Patreon community and helping to support independent writing on opera. Alternatively, you can support operatraveller.com with a one-off gesture via paypal. There is no high C-sharp anywhere in Lady Macbeth’s first act scena. Thanks for spotting. I went back to the score and yes, it’s a C natural rather than a C sharp. In any event, it wasn’t quite made today.